Sometimes when I run out of topics to write about for the blog I would visit the fabric store to find new material. 😀 But other times, I am inspired by visitors like you! 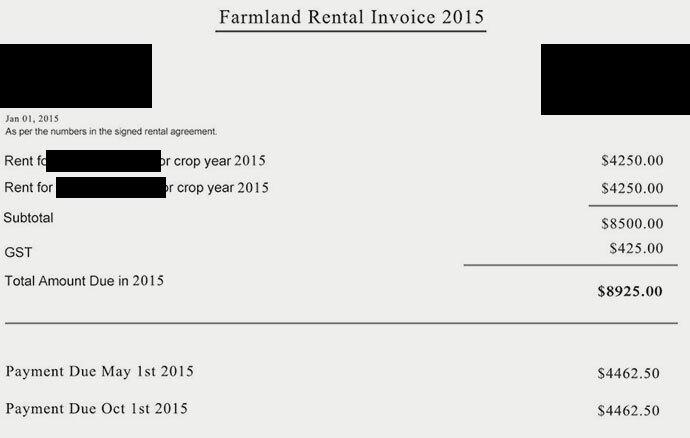 A while ago a reader requested I do a profit and loss statement for my farmland. Great idea! So today’s post is a financial update about my farm’s earnings. Revenue from my farmland comes in the form of rental income. Both farms are leased to the same farmer who grows crops on it every year. Expenses include interest on bank loans and property tax. There are not a lot of costs associated with owning farmland. It’s only land so there’re no buildings or lawns to maintain. Let’s take a closer look at 2015’s numbers. Revenue is down about $1,500 from the previous year because crop prices are lower. Since the prices of soft commodities like wheat and canola have fallen I’ve agreed to lower the rent for this year. If crop prices rise in the future I will be paid more. As for expenses, it is dramatically down this year thanks to the lower cost of borrowing. 🙂 Many were hesitant to borrow money last year because they thought when interest rates go up they will have a harder time servicing their debts. That’s not wrong, but I don’t personally adopt that kind of mindset because timing rate hikes is a fool’s game. The central bank actually lowered rates this year, twice. So now investors like myself, who have already borrowed money, are paying less interest than before. And our investments continue to perform well. Here’s a look at my current farmland loan situation. I only have about $200,000 left to pay off. Prior to now I was paying 3.89% interest rate on my loans. But now it is only 3.43%. 🙂 Both my loans share the same interest rate. The reason I have two loans is because I bought my farms separately – one in late 2012, and the other in 2013. With my current $200,000 balance, I would only pay $6,860 a year for interest. The total property tax this year is about $1,600. However, I can save about $80 if I pay my property tax before the end of this month, which I plan to do. So after a few years I am finally making a $100 profit! I can’t wait to spend all that money. But as I wrote back in 2012, most of the gains from farmland investing is from capital appreciation. According to Statistics Canada, from 1981 to 2014, farm asset values have increased by more than 300% to over half a trillion dollars today. Last year Saskatchewan farmland prices experienced the highest average increase at 19%. This represented about 150% return on my investment due to my 8x leverage strategy. Compared to other types of investments farmland is still an attractive long-term hold. To analyse stocks investors often use the price to earnings ratio. The lower the P/E ratio is, the more return on investment the stock should generate over time. This is a useful way to find the best-valued stocks. With farmland, we can evaluate similar metrics by using the price of land relative to its income-earning potential. So instead of using price per share, we can use price per acre of farmland. And instead of using adjusted earnings we can use cash receipts. Farm cash receipts are not the same as net income, but it does a better job at tracking the patterns in farmland values. Below is a chart showing the average P/E ratio in different provinces over time.